Do you like discovering weird stuff in NYC that hardly anybody else seems to know about? I sure do. A couple of years ago, Geoffrey told me about a visit he made to an art installation in SoHo which consisted of one loft apartment filled, wall-to-wall, with a waist-high layer of dirt. And I was like, “That sounds pretty weird.” Then I basically forgot all about it, until earlier this week, when I was looking for a way kill an hour between leaving the office and attending an art opening. The gallery I was going to just happened to be located around the corner from what I had been referring to as The Dirt Apartment, which is officially called the New York Earth Room, so I decided to check it out. The Earth Room is located on the second floor of an otherwise nondescript building on a block mostly occupied by prohibitively expensive designer clothing boutiques, and you have to be buzzed in from the street. A sign in the lobby tells you to walk one floor up the narrow stairs to reach your desired destination, and then you really can’t miss it. There’s a small reception area at the far end, with the viewing area of the Earth Room just past the entrance, on your right. When you first enter the space, it feels like you are in a sauna: hot, humid, almost stifling — but, despite the obvious lack of air-conditioning, the docent on duty, Brian, who was wearing a wool sweater, told me that after being in the room for a few minutes, it actually starts to feel cold in there. I was skeptical, but he was right. What does it smell like in there? It smells like the earth. 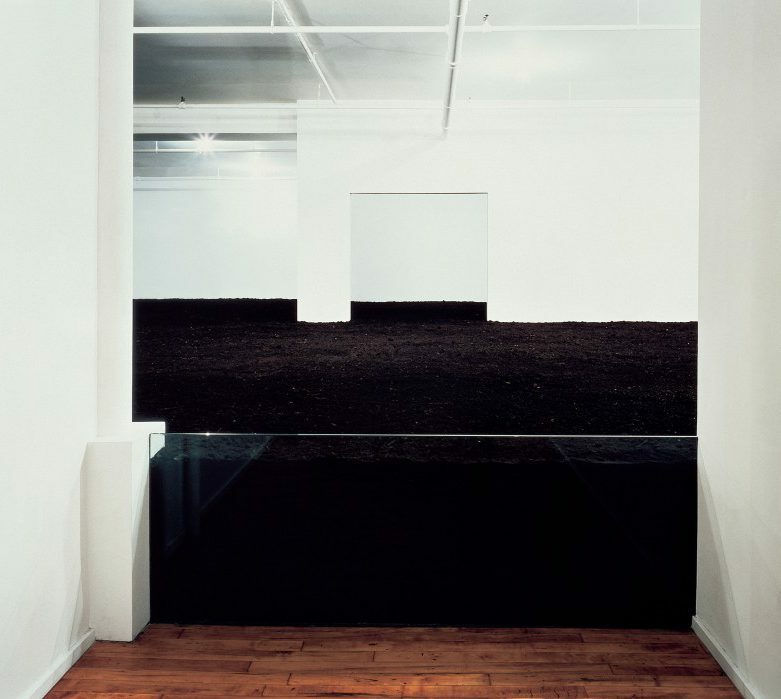 The New York Earth Room (1977) is the third Earth Room sculpture executed by the artist Walter De Maria (1935 – 2013), the first being in Munich, Germany in 1968. The second was installed at the Hessisches Landesmuseum in Darmstadt, Germany in 1974. The first two works no longer exist. Brian was very enthusiastic about answering all of my questions and he explained that the space was formerly a commercial gallery, where the Earth Room was created as a regular exhibit. Somehow, the gallery owner decided to donate the loft to the Dia Art Foundation so that the work could remain on long-term installation (or something like that. I am likely omitting many details). The New York Earth Room has been on long-term view to the public since 1980. This work was commissioned and is maintained by Dia Art Foundation. The New York Earth Room is a work of art meant to be viewed, not entered. You are asked to not touch the dirt. Photography is not permitted, in accordance with wishes of the Artist. Another interesting fact: the caretaker, Bill Dilworth, has taken care of the dirt for 28 years. The dirt is watered on a regular basis, and churned, so that the soil looks fresh. You may not think that many people want to visit an apartment filled with dirt, but you would be incorrect. Brian told me that I was the 100th person to visit on that day, and most days there many more visitors. I am not fronting when I suggest that being in the Earth Room may inspire you to engage in deep contemplation of the meaning of life and the existence of all things. I am now in love this exhibit and can’t wait to visit again many times. Earth Room! The New York Earth Room is Located at 141 Wooster Street (Between Prince and Houston), 2nd Floor, SoHo, New York City. Hours are Wednesday – Sunday, 12–6 PM (closed from 3–3:30 PM). 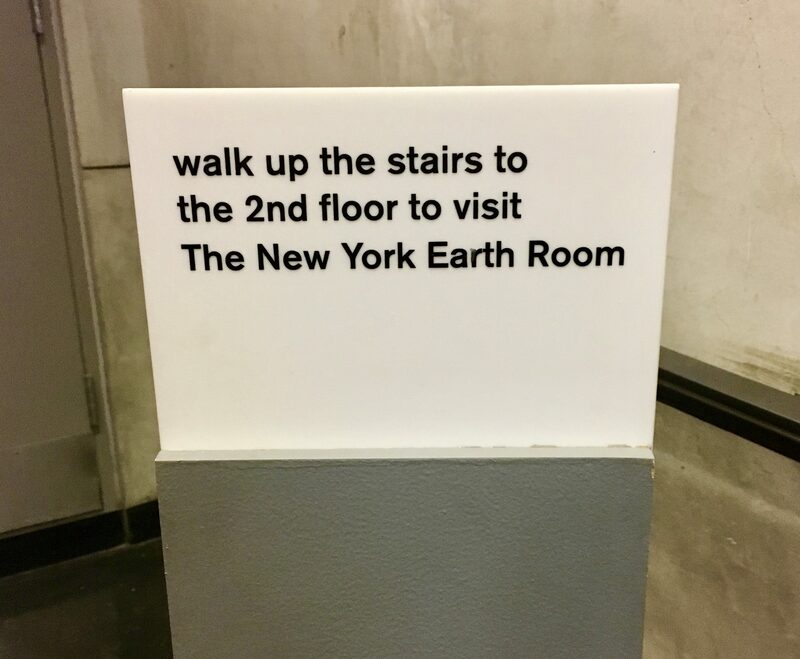 The New York Earth Room closes for the summer on Sunday, June 17th, 2018. It will reopen on Wednesday, September 12th, 2018. The installation is also closed on Thanksgiving Day, Christmas Eve, Christmas Day, New Year’s Eve and New Year’s Day. Admission is Free. Thanks for the shout out! Love this place!